Karwa Chauth' is a ritual of fasting observed by married Hindu women seeking the longevity, well-being and prosperity of their husbands. In the evening, women dress up in special clothes, usually a red or pink sari or 'lehenga-choli' with gold woven 'zari' patterns. New brides often wear their bridal costume. 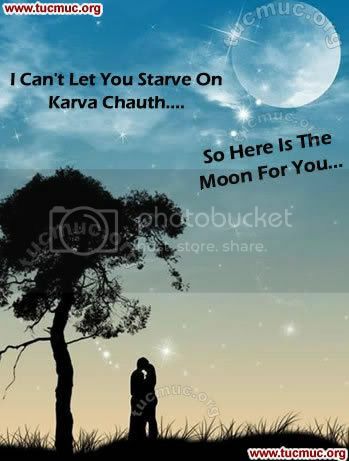 Karwa Chauth is popular amongst married women in the northern and western parts of India. May The Moon Light, Flood Your Life With, Happiness & Joy, Peace & Harmony. Happy Karwa Chauth!